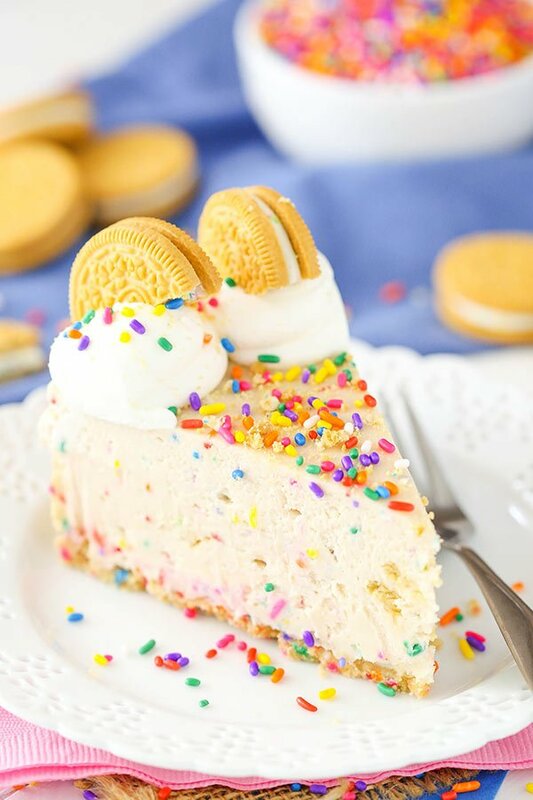 No Bake Golden Birthday Cake Oreo Cheesecake with yellow cake batter & Golden Birthday Cake Oreos. 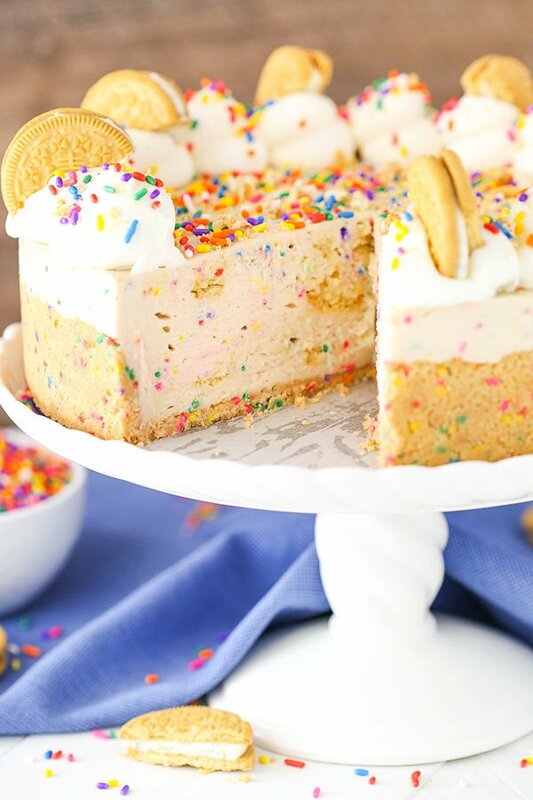 A no bake, easy cheesecake recipe perfect for any celebration! Since moving to Atlanta several years ago, the new Christmas tradition has become that on Christmas Eve, my brother and his family hosts everyone for dinner and then on Christmas Day, everyone is at our house for dinner. Also, now that I’m “the official dessert person” in the family, I’m usually tasked with dessert for the meals. 🙂 Since my birthday is on Christmas, I decided to made this cheesecake for Christmas Eve, along with these cookies. If there’s two things I love in a birthday dessert, it’s cake batter and sprinkles. However this cheesecake was made on sort of a whim. I knew I was going to make the cookies. My family loves caramel and my dad had been craving them after I made them the first time. But I wanted something in addition to cookies that was celebratory, so I looked in my pantry and fridge to see what I had and the Golden Birthday Cake Oreos just popped out at me. They are hands down my favorite of the Oreo options. 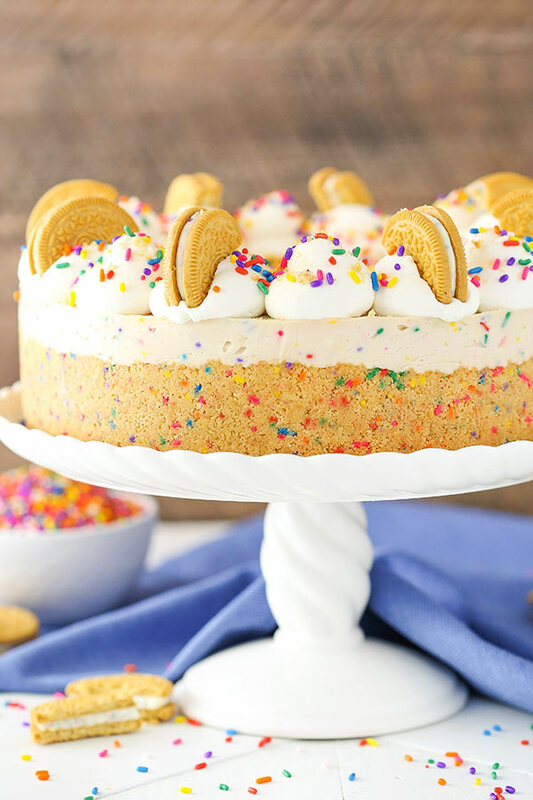 The Golden Oreos are seriously the jam and when you add birthday cake flavor to them, I seriously can’t keep them in the house or I just eat the whole package. I started with the base for my original No Bake Oreo Cheesecake and went from there. 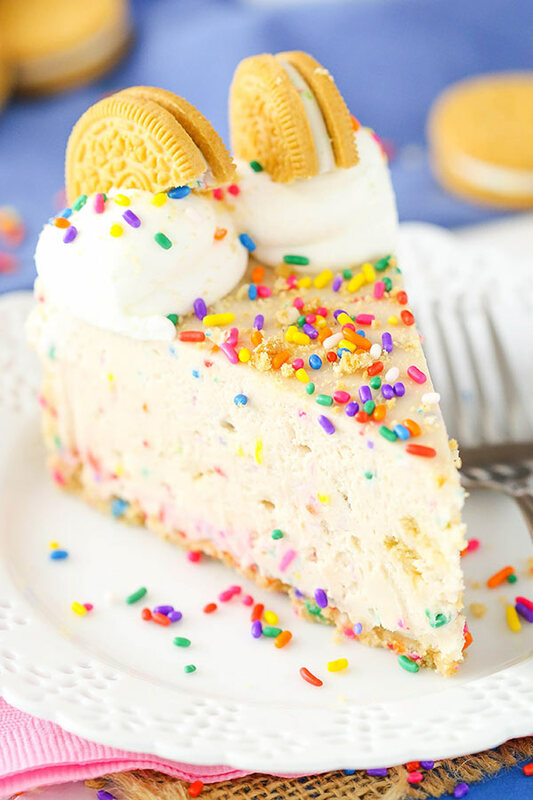 I knew there had to be sprinkles in the crust – it was a birthday cheesecake. Duh! And I decided to pop them in the food processor along with the Oreos rather than adding them after. It doesn’t chop the sprinkles too small, but makes them a little more manageable when pressing the crust into the pan and helps distribute them well throughout. 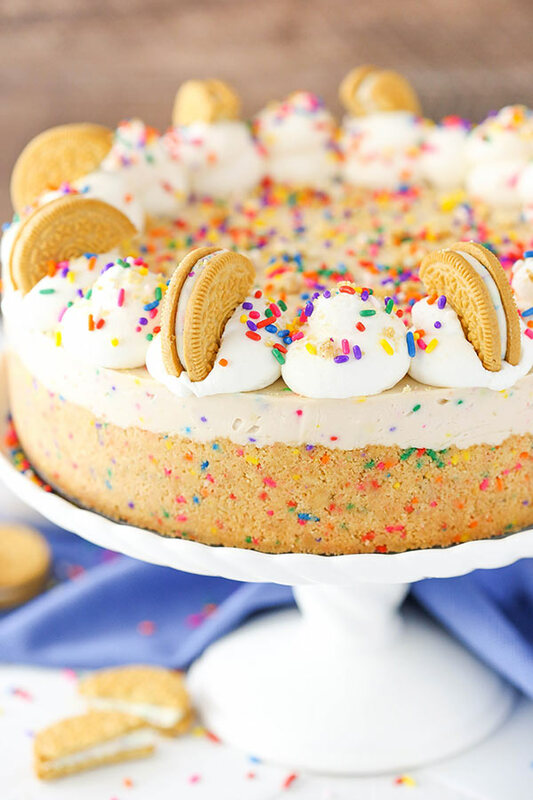 For the filling, I knew I wanted to use plenty of the Golden Birthday Cake Oreos and I had thought that’d be enough. They are so cake-y flavored when you eat them. Ultimately I decided I wanted more birthday cake flavor and added in the cake mix and some milk to offset the additional thickness it adds to the batter. It was a terrific choice! Cake batter flavor galore! 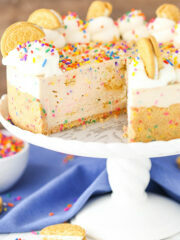 Between the Golden Oreos and the cake batter flavor going on, this cheesecake was a hit! And it turned out so cute and festive, I decided to take pictures and share the recipe. It wasn’t originally in the plans, but I couldn’t not share something this tasty. We all loved it and my birthday was appropriately celebrated. 🙂 I hope you enjoy it too! 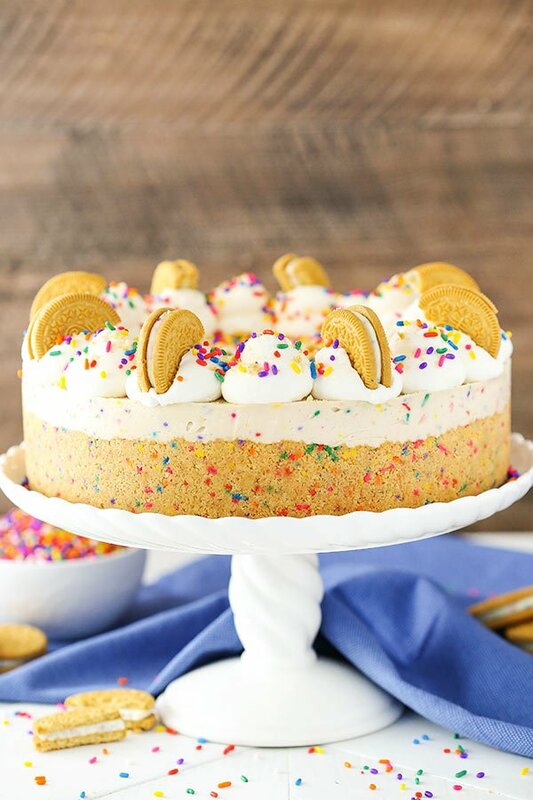 No Bake Golden Birthday Cake Oreo Cheesecake with yellow cake batter & Golden Birthday Cake Oreos. 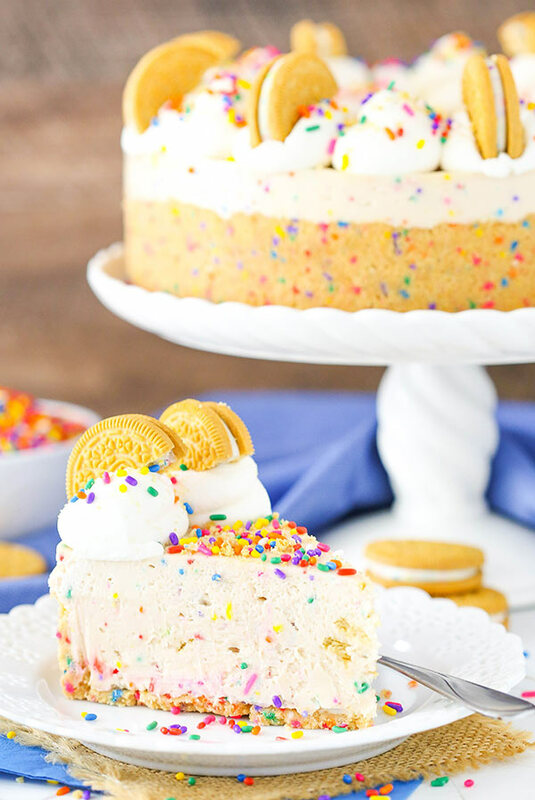 A no bake, easy cheesecake perfect for any celebration! 1. 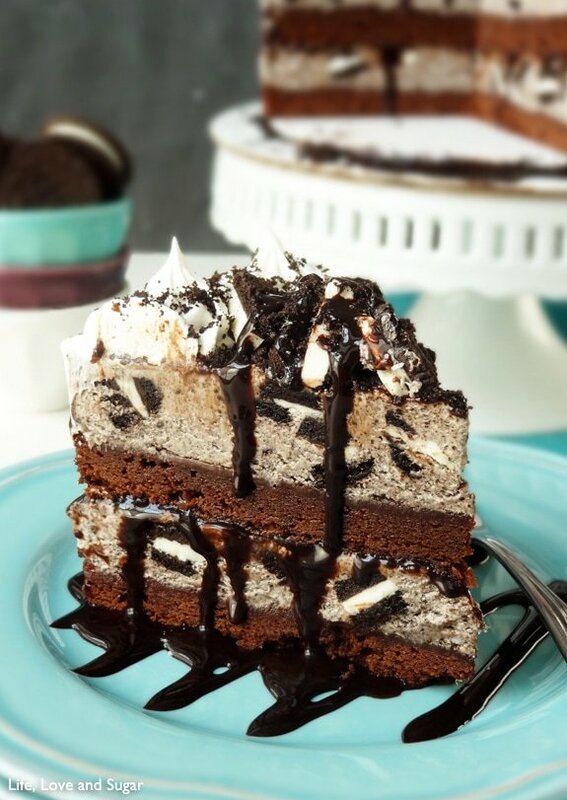 To make the crust, add the Oreos and sprinkles to a food processor. Pulse until they form crumbs. 2. Combine the Oreo crumbs and sprinkles with the melted butter and stir together until well combined. 3. Press the crumbs into the bottom and halfway up the sides of a 9 inch springform pan. Set in the refrigerator to firm. 4. To make the filling, mix the cream cheese and sugar together in a large bowl with a mixer until smooth and well combined. 5. Add the vanilla extract, cake mix and milk and mix until well combined. 6. Fold in the Cool Whip (or homemade whipped cream). 7. Add the Oreo crumbs, chopped Oreos and sprinkles and gently stir until well combined. 8. Spread the filling evenly into crust and smooth the top. Set in the refrigerator until firm, 4-5 hours. 9. Remove the cheesecake from the pan. 10. To make the whipped cream topping, add the heavy cream, powdered sugar and vanilla extract to a large bowl. Whip on high speed until stiff peaks form. 11. Pipe swirls of whipped cream around the top of the cheesecake. Top with additional Oreo crumbs and Oreo halves, if desired. 12. Refrigerate until ready to serve. 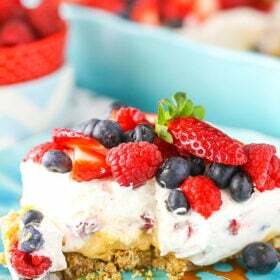 To use homemade whipped cream in the cheesecake filling, substitute 1 1/4 cups cold heavy whipping cream and 1/2 cup powdered sugar for the Cool Whip. Happy Belated Birthday Lindsay! Pray you have many more. Your cake is beautiful and always impressed by your talents. For those of us not quite as talented in the decorating and developing of recipes that you are, please clarify-the 1 cup of cake mix. Did you use a cup of funfetti cake mix? Or did you use white cake or yellow cake? All three have distinct different tastes to me; maybe it wouldn’t matter which but for grins and giggles would like to know what you used as the photo is almost worthy of taking a bite! As always, the recipe looks delicious, and I can’t wait to try it out. Tried it and wow…… awesome alternative to birthday cake – kids loved it! 2 Qs though…. mine was quite dense even before it set and didnt have the cheese cake texture – could it be the cream I used? (We in new Zealand – used thickened cream) should I have ratherused normal? And – the crust was a tad sweet – could plain biccies work? Hi, this cake looks adorable and delicious! I plan on making it next week for my daughter! 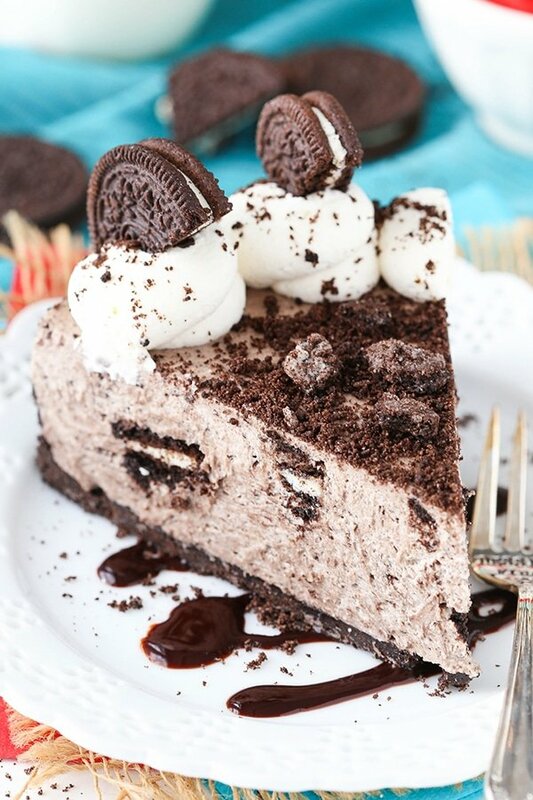 For the crust, do you use the entire oreo filling and all? Or just the cookie part? 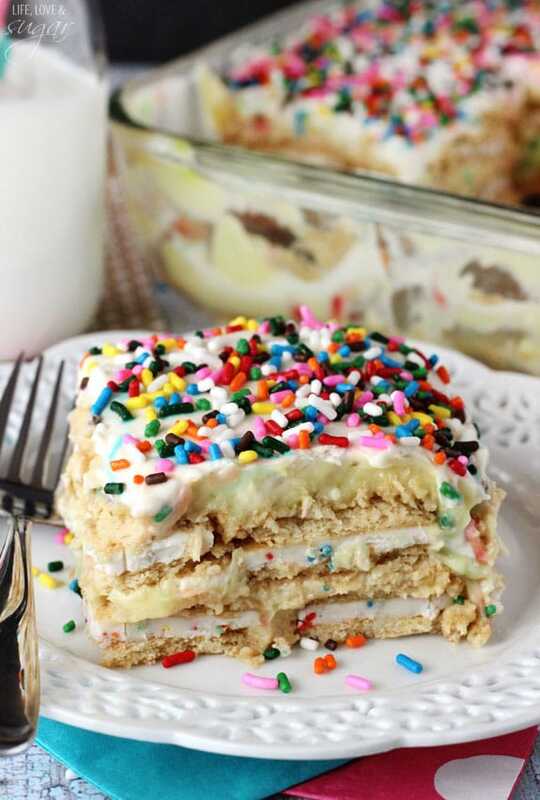 Do you have cake mixes in Italy you can add sprinkles to? That’d be the best option. Hi, I just want to say that I made this for someone at work last week. It was her birthday and I must say everyone was astonished at how beautiful it was! My co-workers thought I bought it at a local bakery. I even had people placing orders for one of their own lol. I will note that the cookies on top will get kind of soft from being in the refrigerator with all that moisture. I mean who cares because they’re Oreos but if you want crunchy cookies, don’t leave them in the fridge too long or add at the last minute. Also, I wanted to let you know that every potluck we’ve had at work has featured something from either your cookbook or website and I’ve become a small celebrity lol. My rule is you don’t get to eat anything I bake for the potluck if you don’t bring anything yourself and let’s just say participation is at an all-time high. I’ve made it my mission to bake your entire cookbook too!! Thanks for being awesome!! Hello!! I am currently baking this and had a quick question? How long do the crust in the fridge to firm? However long it takes to make the filling is fine. It’ll all continue to firm up when you put the finished cheesecake in the fridge. I can’t find the Golden birthday cake Oreo’s only chocolate ones.. should I just get the regular golden ones and scrape the filling from the chocolate? You certainly could, though that would take some time. 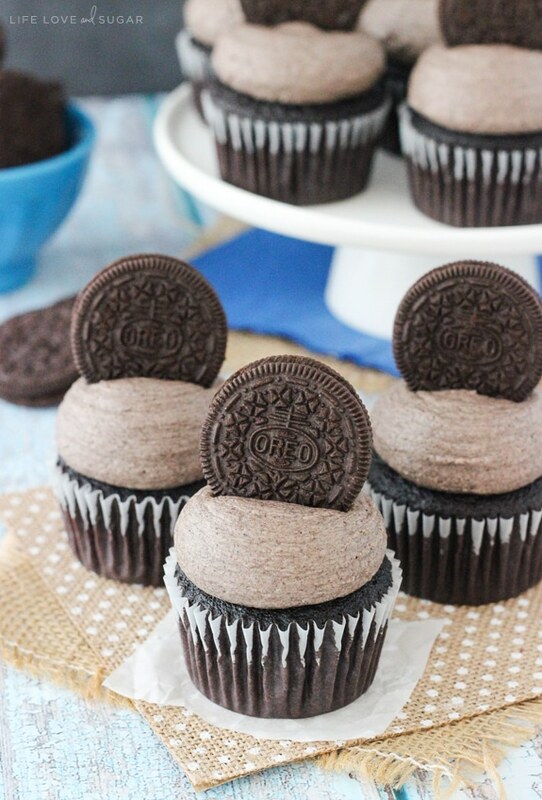 You could also just use regular Golden Oreos. There’d still be quite a bit of the cake flavor from the cake mix. I was very disappointed with the results for a couple of reasons. The ratio of butter to crumbs for the crust did not allow the crust to set up good even after being in the refrigerator for several hours on its own. The consistency of the finished product was glue like. Also, It was impossible to cut Oreos in half, to decorate the top of the dessert, without them crumbling into pieces. Not happy to have wasted my money and effort. Hello – would this still be as good if I cut the recipe in half ? Sure, you’d probably just want to use a smaller pan. Hi from Arkansas. My daughter chose this dessert for her 17th birthday which was may the 2nd. We couldn’t find the golden birthday oreoes but found the chocolate ones and decided to use those instead. It turned out great everyone was pleased with the finished dessert. Thanks for the great recipe. Would you be able to omit the funfetti batter from the recipe and just have the center be good and no bake still? You could leave it out, yes. Also, Do the cookie crumbs and halves in the filling change the texture? Do the halves get soggy? The cookies do add some texture to the cheesecake, but they don’t get soggy. How far in advance can you make his and keep in the fridge ? I try not to make things more than a day or two in advance, but it should be ok for about 3 days if you need. Please make sure you include baking instructions for the funfetti ingredient. Adding uncooked flour to a recipe can give you salmonella poisoning! 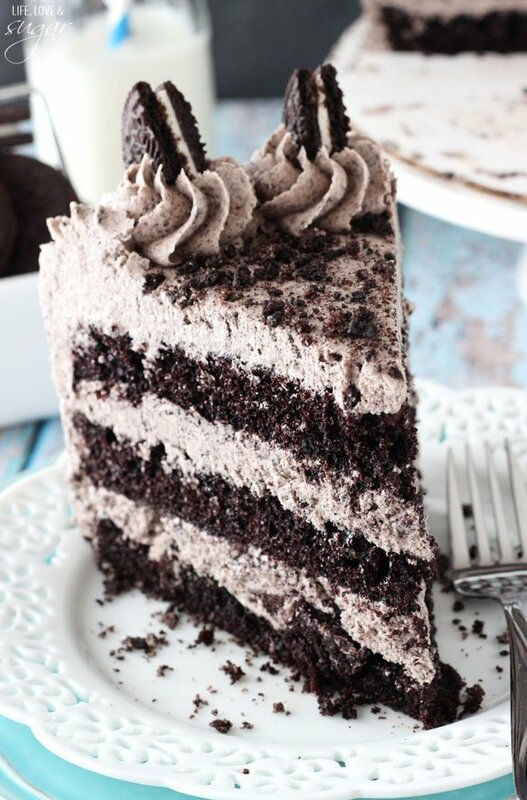 I’m making this for a birthday dinner and it looks to die for… Pun intended ???? 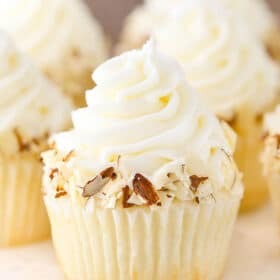 When using whipping cream instead of cool whip (I’m from the uk and we don’t have cool whip here) do I whip the cream until thick and mix it with the powder red sugar before folding into the cheesecake mixture? I whip the heavy whipping cream and powdered sugar together until stiff peaks form and then fold it into the mixture.